SAN MATEO, Calif., Oct. 11, 2017 /PRNewswire/ -- Brilliant, the company that created the Brilliant Control to give consumers voice and touch control over lighting, music, climate, and other smart home products, today announced it raised a $21 million Series A, led byAugust Capital.Other participating investors include Miramar Ventures, The Box Group, and the Stanford-StartX Fund, creating one of the largest Series A investments in the smart home industry. Additionally, Brilliant has appointed former Sonos sales executive Kostas Reissis as its new Vice President of Sales. "We created the Brilliant Control so anyone can easily access any smart home product with touch or voice from anywhere in the house," said CEO and Co-founder Aaron Emigh. 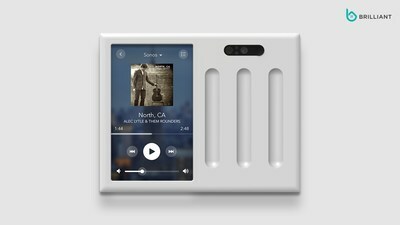 "Ambient computing is the next big technology trend, and the home will be the battleground. Support from investors of this caliber is a validation that a great experience is critical in the smart home of the future." As part of the investment, August Capital General Partner David Hornik will be joining the Brilliant Board of Directors. "We are thrilled to help Brilliant bring their innovative product to market," said Hornik. "Smart home products have gone mainstream, but the consumer experience is too complicated. Brilliant has elegantly solved this problem with a product that anyone can install and use, and has the team and traction to completely transform this growing industry." Brilliant will use this financing to expand retail channels, partnerships, and continued investment into research and product development. Brilliant had recently expanded its headquarters in Silicon Valley, and doubled the size of its R&D team. Brilliant is also announcing the appointment of Kostas Reissis as its new Vice President of Sales. Mr. Reissis was previously a sales executive at Sonos, Inc. for 13 years, where he held multiple sales leadership roles, culminating in his role as Director of Sales, US, in which capacity he was responsible for growing Sonos into one of the most successful consumer electronic brands of all time. "I am very excited to join the Brilliant team," said Reissis. "There are many parallels to what made Sonos successful - fantastic engineering team, breakthrough product, and huge market potential - plus we are joining at a time when voice computing and home automation are just beginning to become a part of everyday life. This is an incredible opportunity." 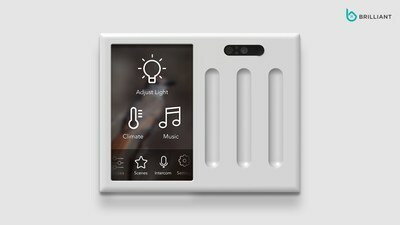 The Brilliant Control replaces an existing light switch to give you and your family voice and touch control over lights, music, climate, and other smart home products. Amazon Alexa is built in, as is a video intercom, mobile app control, and many other features. Brilliant Controls start at $199, and will be available for sale at https://www.brilliant.tech in early 2018. Brilliant creates technology that makes it fun and easy to interact directly with your home. Co-founded by serial entrepreneur Aaron Emigh, Brilliant is comprised of experienced entrepreneurs and engineers from companies such as Apple, Philips, Sonos, PayPal, Cisco, Palm, Digidesign, Opsware, and shopkick. Brilliant is based in San Mateo, CA, and is funded by August Capital, Miramar Ventures, and other prominent investors. For more information, visit www.brilliant.tech and see our video, or find us on Facebook, Twitter (@BrilliantTech), or Instagram.